I recently watched Zindagi Na Mile Dobara. Nice theme. Open air. Freedom. Sense of achievement. The film seemed to have it all and I did like watching it. Its just that when ‘Ik Junoon’ started playing and the entire screen became one large blood red tomato, with a shirtless Hrithik cozying up to Katrina in the midst of it all, I kind of lost my appetite. Seriously. I just found out. Over SIXTEEN TONNES of tomatoes were imported for the song. I mean, I had felt queasy earlier on during the movie, but today I feel downright nauseous. 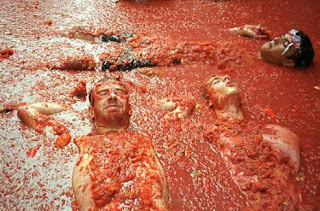 Of course, when the Indian version of the ‘La Tomatina’ was announced, my nausea was magnified, alongwith an aching feverishness and a dull headache to go with it. If I knew my country well and if I was well versed with the boisterous/free spirited nature of my countrymen (which I think I am), I was certain that if it was permitted, a ghastly amount of tomatoes would end in SPLAT, just for the heck of it. Inwardly however, I was also well versed with the logical/practical and humane rationale of the common Indian masses and I was thrilled to note the immensely negative responses that this particular ‘festival’ incurred. People from all over the country blogged, wrote, twittered and emailed about the idiocy of our country following in another’s wasteful footsteps, when we ourselves had so many millions of mouths to feed…Most Indians just could not ‘stomach’ the fact that in a country where 5.6 million children die of malnutrition every year, there were some excitable souls actually enthusiastic about whacking each other with tonnes and tonnes of tomatoes, just because someone else does it. I read one particular blog where this guy was urging people to attend the festival and buy the tickets from him. He was exceptionally excited about it because he believed that the ‘festival’ would rake in big money by way of tourism and related activities. Huh? The project was still in the pipeline, still to happen, and this guy had already christened it a ‘festival.’ How on earth does something become a national festival before it has even happened? Just because it’s a festival in Spain? Defies logic, if you ask me. Secondly, I did not understand (forgive my ignorance) exactly how boosting tourism a bit justifies wasting lakhs and lakhs of tomatoes in a couple of hours or days? As it happens in India, the common Indian’s voice is what holds the country together and gives it direction. After hundreds of petitioners urged Bengaluru CM Deve Gowda, online and in person to stop this insaneness (in short), he actually took a stand and directed police officials to intimate the sponsors and organizers that the ‘festival’ will not be allowed this weekend as planned in Mysore and Bengaluru. I also heard that the Delhi police banned the ‘festival’ last month after a series of fervent protests. Apparently the basis for all these protests was that the tomato is a nutritious food item and it is an unjustifiable act to waste it on vulgar entertainment and revelry that would last only a few hours. Given the fact that India has 25% of the world’s hungry poor (World Food Programme), I would say this basis itself stands on solid ground. No point of contention. 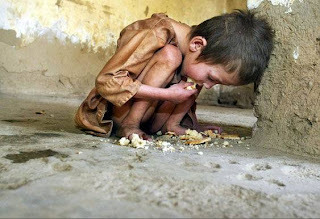 Apparently, the other basis for the protest was that wasting food in such a way is against Indian ethos. Hats off to that sentiment as well. I can go so far as to say that such mind boggling wastage and the mere attitude behind it, is against the basic moral fibre of HUMANITY. So there. This is one of the few times, when an Indian politician has done me proud. I can be candid in saying that D Gowda’s stand makes me extremely happy. As for those youngsters and other individuals who believe that happiness can be found in smashing tomatoes into each other’s faces while DJ’s rock the floor with whoopee music, I sincerely hope that the next malnutritioned child or nursing mother you come across, makes you see the world for what it is and not for the bubble you wish to live in. As for film makers, I hope this makes you realize just how important a role you play in influencing the mind of a nation. Take responsibility for it, I will say no more. Viva la Tomatina? No way! Viva Le Aam Indian Junta!! !